From left, third-graders Maxwell Becker, Anastasia Moshovetis and Eliza Frehsee hold up a question about Leo Arden, a character in one of Chris Harris' poems whose parents forgot to teach him the number eight. 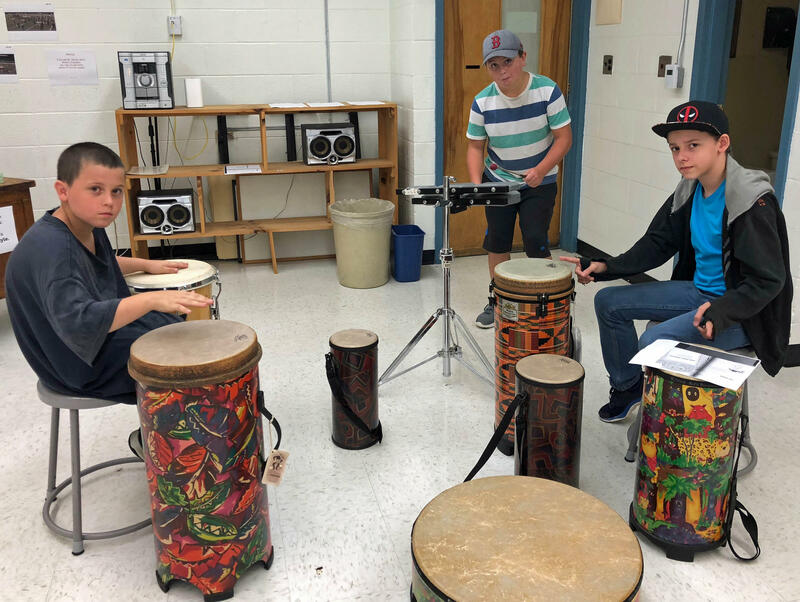 They were performing their own musical interpretations of poems from Chris Harris’ collection I’m Just No Good At Rhyming And Other Nonsense For Mischievous Kids And Immature Grown-Ups, one of this year's nominees for the Dorothy Canfield Fisher Book Award. And some students also had questions for Harris about his book of poetry. Zack Parent: "What was the first story you wrote?" Chris Harris: "Oh my gosh, what was the first story I wrote? Um, ever? Oh my gosh. Zack, this is a tough question. I expected a few softballs when we started out. "Um, the first story I wrote, I can remember it was in first grade. I cut a bunch of pieces of newspaper into quarters and stapled them together and wrote directly over the newspaper font. And it was called 'The Masked Marvel Versus The Blob.' And all I can tell you is that I think the Masked Marvel won. And it did not make it into my book, and it probably won’t ever make it into another book. That was probably the first story I wrote." 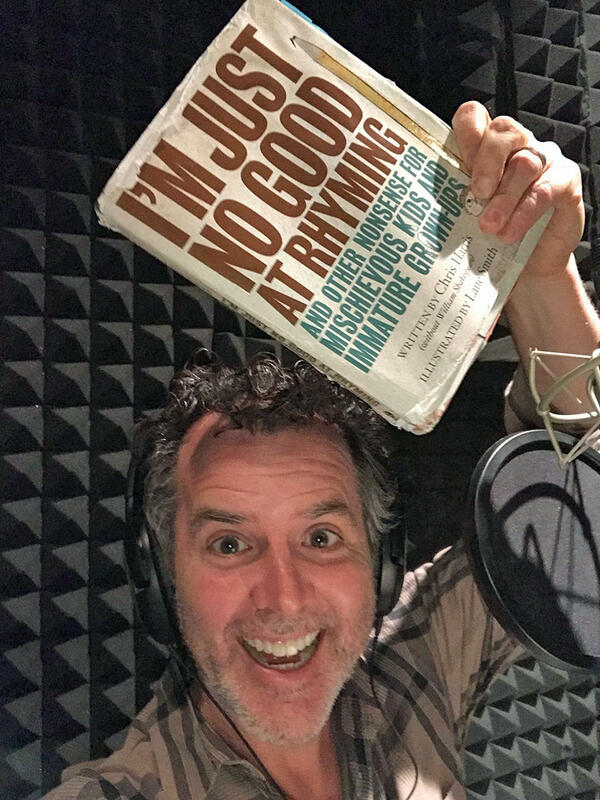 Author Chris Harris took a selfie while talking to VPR from Garden of Sound studios, in Los Angeles. Chris Harris: "The title poem came about because I really wanted to write a book of poems for my kids. And I got to poems because I really don’t have any other skills. I’m scared of hammers and nails, so I couldn’t make them a treehouse or anything like that. I’m just no good at rhyming. And that’s why I’m so blue. And that’s why I’m so sad. ‘Cause I just can’t rhyme words at all. While Harris wrote the poetry collection for his children, one second-grader wanted to know if a certain other family member has read it. Myla Thomas: "Has your mom read your book?" Chris Harris: "Myla, that is a great question. Yes, she has read my book and, most importantly, she actually liked it. Which was such a relief to me, because I don’t know if you’ve ever shown your mom something that you drew or something that you wrote, but you really want them to like it. And guess what? Whether you’re in second grade, or 12th grade, or you’re 46 years old, there’s nothing like showing something to your mother and finding out that she really likes it." While this is Harris’ first book of poetry, he’s been a professional writer for a long time. Most of the writing he’s done has been for television shows like How I Met Your Mother. Another second-grader was curious about the job of being a writer. Chloe Banas: "I wanted to know, is ... being a writer hard work and does writing hurt your hands?" Harris says writing is a lot of work, but it’s not necessarily hard work. "So, it’s not hard work compared to most jobs, I think. It does take a lot of thinking, and especially if you want to do your best at something. It takes a while to come up with the ideas sometimes. "But, overall I think writing is a lot of fun. I wouldn’t trade it for anything. … In terms of ‘Does it hurt my hand?’ sometimes it does if I’m writing a lot. But that’s why I use a laptop computer most of the time … but I imagine if I didn’t have that, and I just had to write everything with a pen and pencil, then my hand would definitely hurt. "And worst of all, probably no one would be able to understand what I’m writing because I have such terrible handwriting – including me. I would write something and then I’d look at it and I would say, ‘I don’t even know what I just wrote.’ So instead of a book of poems you would just have a book of scribbles." Harris says there are some extra perks when you write for television. Chris Harris: "In TV writing, people bring us our lunches and they bring us our snacks. And that seems like it’s just about the best job ever because that happens … So, I’m glad there are computers. The hand doesn’t hurt too much. Writing’s a lot of fun and they bring you snacks." Now, getting back to the book, in addition to lots of funny poems, there are some running gags threaded between the covers. One is an ongoing argument between Harris, the author, and illustrator Lane Smith. Anastasia Moshovetis: "Is the illustrator your friend?" Harris says they are friends — at least as far as he knows — and that he floated the idea for the joke when they first started working together. Chris Harris: "And I said to Lane, 'Hey Lane, what if we — in the book — pretended that we didn’t like each other?' And Lane jumped on that idea really excitedly. He was like, 'Oh yeah, yeah, great! Great idea Chris!' It was almost like he was saying, 'Yeah, sure, let’s pretend that we don’t like each other, Chris.' But I think, I think he likes me." Harris says the joke starts even before the first poem. Chris Harris: "It starts on the dedication page, where I first dedicate the book to my wonderful wife and delightful children. And then Lane dedicates the book also to my wonderful wife and delightful children. And we get into a little bit of a scuffle there and I think that’s kind of weird, but that’s okay. And then, as the book goes on, there’s one point where he starts interrupting my poems, telling me they’re too silly and he refuses to illustrate them. "And, finally, I get so fed up that I end up writing an entire poem called 'I Don’t Like My Illustrator.' And it, the poem, ends with me wondering, 'Wow, I wonder what the illustrator’s gonna draw on this next page?' And then, of course, on the next page is this hideous, hideous picture of [an] awful, disgusting monster. And above it is written, in Lane’s handwriting, 'This is what Chris Harris looks like.' And it’s almost as bad as my publicity photo." 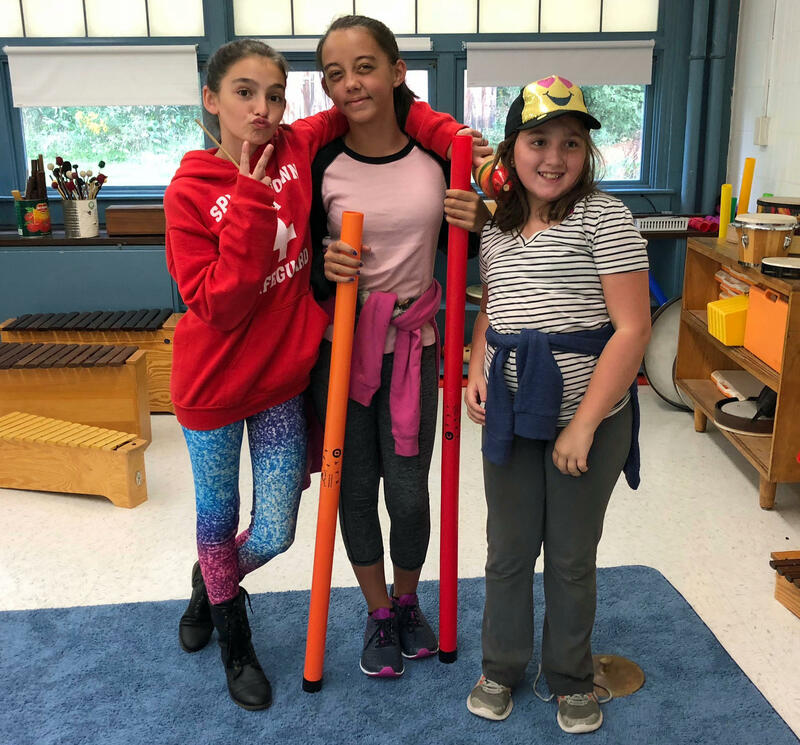 From left, sixth-graders Rose Stone, Haley Bogert and Alexandria Lamoureux practiced 'Infinity Poem' in the music room, before performing it for the entire school. Maxwell Becker: "I’m pulling my ear right now. Shneeple!" As strange as it might sound, that drew a laugh from Harris, who responded equally strangely. Chris Harris: "Well in that case, I’m slapping my forehead. Shnomple! ... In the author’s bio at the end there, I promised that any kid who pulls their ear and tells me 'shneeple,' I will respond by slapping my forehead and saying 'shnomple.' It’s been a lot of fun. I wish I had picked something that was not as physically violent to myself as slapping my own forehead. But it’s too late for that. So, thank you Maxwell for the red mark that is now on my forehead." Hopefully, Harris won’t have to go on forever slapping his forehead every time he meets a fan. 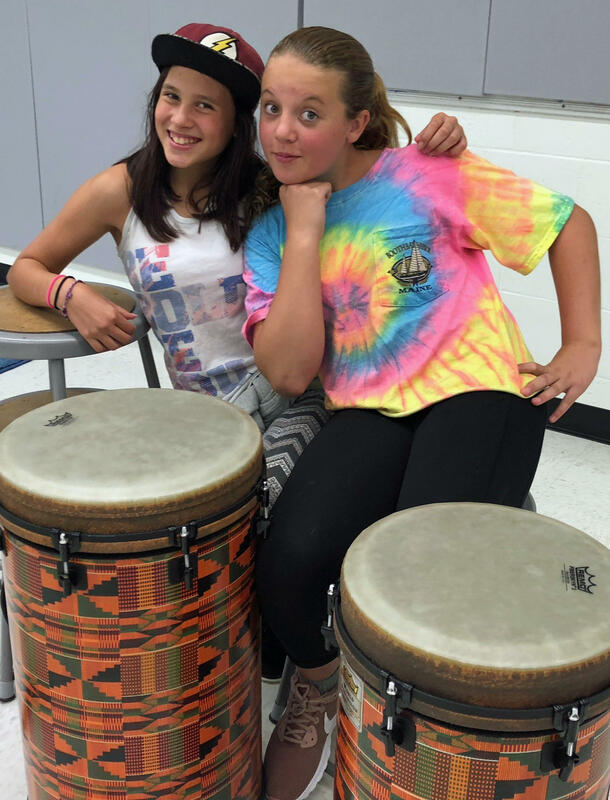 Special thanks to Guilford Central School Music Teacher Steve Damon and Teacher Librarian Angela Saviano. More episodes of Dorothy's List can be found on our program page. Coming up next month: The next selection on Dorothy's List is Family Game Night and Other Catastrophes. Ask your librarian for a copy so you can read along!